Among many arts activities, Commissioner Mary Peña Noskin owned an art gallery in Albuquerque's Old Town, and helped local children attend performances of the Santa Fe Opera. 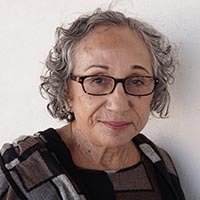 She was chair and board member of the National Hispanic Cultural Center Foundation, board member of the New Mexico Symphony Orchestra, and docent at the Albuquerque Museum of Art and History for 23 years. Peña Noskin previously served a term on the New Mexico Arts Commission. She currently volunteers at the National Hispanic Cultural Center.